Paying off your student loans can be a lengthy and arduous process. Depending on your loan balance, it can take several years to pay off your balance and reach debt freedom. I have been making payments towards my student loans for seven long years. I went to graduate school within that time and accrued more debt and have been serious about debt repayment for the past three years. When you know it will take several years to get out of debt, it’s easy to get debt fatigue and lose momentum. But there are a few simple tricks that can help jump-start your student loan payments. If you’re not quite sure where to start or what to do, consider hiring a CFA to help you with your student loans. We recommend Student Loan Planner to help you put together a solid financial plan for your student loan debt. Check out Student Loan Planner here. Instead of paying your loans monthly, start making biweekly payments instead. By making biweekly payments, you are cutting down on interest and you end up making one extra payment in the course of a year. To get started, simply divide your monthly loan payments in half and pay that amount biweekly. This results in a total of 26 payments, which amounts to 13 full payments, over 12 payments if only paid monthly. In addition, this tactic will help you build momentum. You could get even more aggressive and set up your student loans to pay weekly. This would allow you to make even more progress on your student loans. My favorite way to jumpstart student loan payments is through side hustling. Side hustling is the art of making money on the side, outside of your full-time job or main bread and butter. There are so many ways to make extra money, online and off. To get started, determine what you are skilled at and what people are willing to pay for. After that, reach out to your immediate network of friends and family and then start posting ads online and in coffee shops. Need some ideas? You can side hustle as a pet-sitter, dog walker, event assistant at a holiday party, brand ambassador, greeter, writer, virtual assistant, mystery shopper, focus group tester, and more. 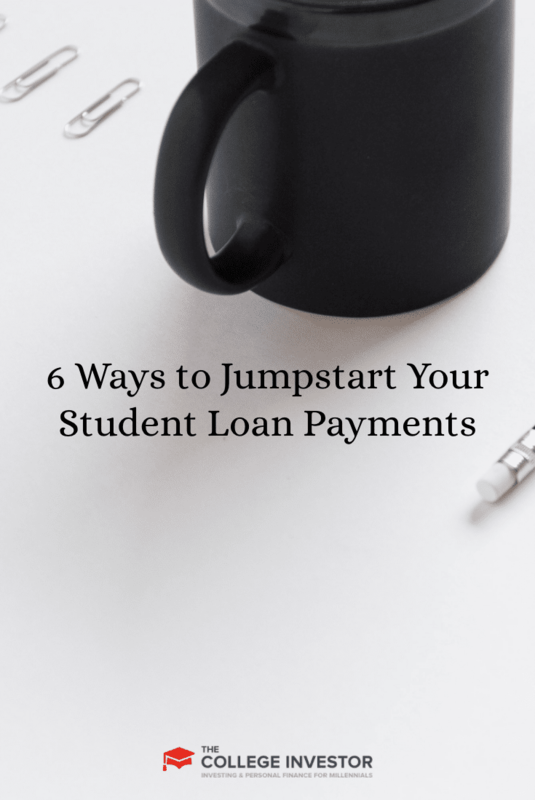 Another great way to jumpstart your student loan payments is to round up. Let’s say your monthly payments are $356.32. By rounding up to $357, you are adding more money to debt. Yes, the amount is small and may seem insignificant, but everything adds up when you are paying off debt. There are some automatic savings apps that can also help you round up your extra money. They can then save it based on goals or other settings that you create — even your student loan debt. Oftentimes people receive money for their birthdays, holidays, and special occasions. Most people use that as “fun” money, instead of thinking of it as an opportunity to pay off debt. I know, I’ve been guilty of it too. Windfalls are a great way to jumpstart your student loan payments as it is outside of your regular budget. My current student loan interest rates are a mix of 2.5%, 6.8%, and 7.9%. The higher numbers are tough to swallow and result in a ton of extra money in interest for me. But instead of being daunted by the high interest rates, I think of paying off debt as a guaranteed investment — both literally and for my financial future. With such high interest rates, I am getting a huge return by paying off this loan early and getting started on a path to financial wellness. We think that paying off debt is one of the best passive income streams that you can set up! To be successful in your debt payoff journey, you need to start thinking differently about money. It can seem overwhelming and depressing to be in debt — but action will be the only thing to get you out. Paying off debt requires you to change your relationship with money and adopt a can-do attitude. I know many people who just give up and surrender to a life of debt. Being debt-free is possible, with hard work and perseverance. Student loans can be difficult to deal with and cumbersome, especially when you are paying them off over a long period of time. 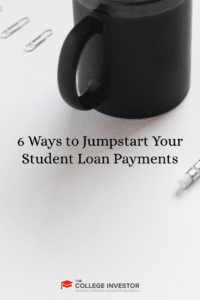 There will be ebbs and flows in your repayment and times when you experience debt fatigue — but with these tips, you can jumpstart your student loan payments and get out of debt sooner rather than later — so you can invest in your future. What have you done to accelerate your student debt payoff? Enlightening read Melanie. Changing your money mindset is probably the most difficult of your suggestions, but the most effective in the long run. The sooner you see your debt as something you can manage and start taking a more conservative approach to managing your funds the better off you’ll be! Looking forward to your next article. Lots of good ideas here! Biweekly payments can be synced up with your paycheck so that 2x a year you can put your entire “extra paycheck” to the loans as well. That’s a huge chunk of what we’re doing this month on my student loans. I would argue that the most important is to change your mindset. Changing your mindset opens up doors that lead to many other debt repayment methods.